Before starting the TEFL certification course, I taught in China for two years. I really enjoyed teaching in a Chinese university as this job made me fall in love with teaching English. Unfortunately, I was not adequately prepared to teach English in a foreign country. I knew I needed to improve myself. 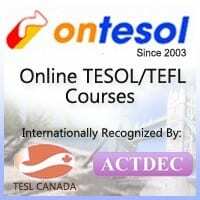 When I searched the internet for an online school, I found OnTESOL. I decided this school was right for me after reading many positive reviews of the courses they offered. After completing the 120-hour course with TEYL specialization, I can honestly say that I made the right decision. When I finished the TEFL course, I realized that my lesson plans and activities in China were weak and inadequate. They lacked structure and depth. The tutors really helped me build a sound lesson plan. Now, if I ever return to China, I have the confidence to build and create a proper lesson plan, thanks to the tutors provided by OnTESOL. I am really thankful for the tutors who helped me throughout the course. I am the type of person who needs lots of support, care, and patience from a teacher. This is what I received from my tutors. They took the time to help me with my numerous mistakes without judgment and they promptly answered all the question I had. On a final note, I am grateful for taking this course. This course equipped me with all the tools I need to become a better teacher. The tutors and course material are excellent, giving me the confidence to plan and implement a proper lesson plan. For this, OnTESOL is worth the money and I recommend this course to anyone who wants to improve their teaching ability. Apply now to teach English in China! OnTESOL offers free recruitment with English First and Aston English in China. earn a great salary plus accommodation, Z visa, airfare allowance, and health coverage!